I’ve had two pints of beer down at Jimmy’s with a small group of folks from Twitter, so pardon me if this sounds disjointed. I’m still in shock, still not sure what I can do to make this all sound as heartfelt and honest and grounded as I’d like to make it sound. Contrary to what the media might have you think, not all goths run around clicking their heels and reveling in the concept of death – and I make this joke not to make light of our current situation in Mariners Land, but because I really really still don’t know how to react to today’s news; I just don’t. It took me a good few weeks to finally have a good cry over my grandmother’s death over a decade ago, and it may actually take a bit longer than that for all of this to sink in and make its little nest of sadness in the part of my brain that registers such things. I think the hardest part of today has not been the actual event, but more what it inspired; mainly, again, via Twitter – messages by the droves from people sending Mariners fans their condolences, and fans themselves trying to make sense of the death of our voice. Dave Niehaus was the Mariners. He was the voice of the team, the game as it was known in Seattle, especially back before the wonderful leisurely days of FSN, which a new fan like me now almost takes for granted. There was a time in this city, before I was a fan, where you couldn’t just casually turn on the TV and watch a game locally. Maybe 30 or so games a season were aired, if fans were lucky. No FSN, no FOX Saturday Baseball, no automatic assumption that one could come home after a hard day’s work in the middle of summer and switch on the game. I could go on and on with this, I really could – this isn’t even half of what was on Twitter, including links to photos and audio clips, blog posts and news stories. And it will likely continue tomorrow. 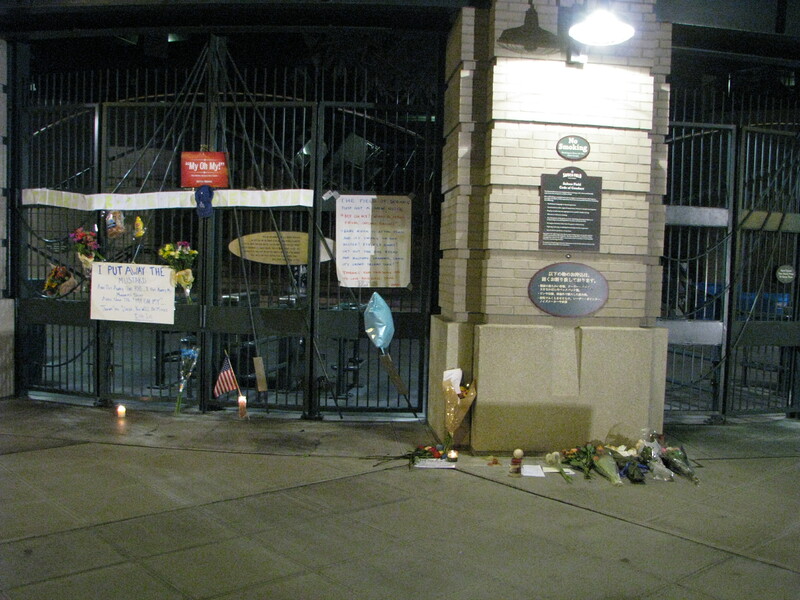 According to King 5 News, the Mariners organization is trying to figure out a way to open its doors to fans tomorrow (or later today, at this late time of 12.45am) for a proper remembrance ceremony. I have an appointment at 10.30 in the morning, and another at 4pm, but am hoping it is planned for a time of day when I will actually be able to make it down to the field. But if all else fails, I was there tonight, and that might have to do. 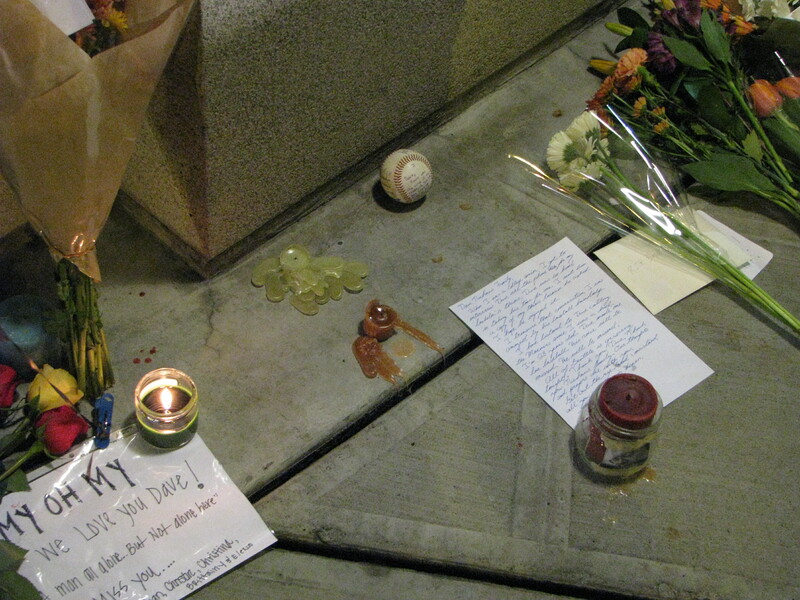 Photos of the small vigil offerings left out by the home plate entrance. As I wandered back to my car, I noticed someone had also left a bouquet of white roses on the thumb of the bronze glove sculpture by the left field entrance. 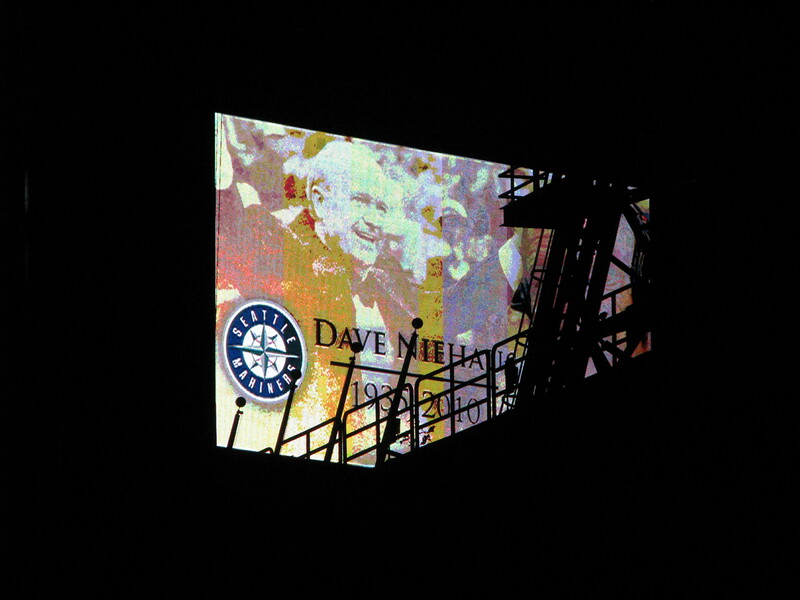 The SafeCo Field screen remained lit up with this image the entire time we were at the bar. I had to leave around 11. I still don’t feel like I have any closure, and it might take me a while to get to that point. For what it’s worth, I’m glad I went down there tonight. It just seemed like what needed to be done. After 5,284 games called by one person, only a fraction of which I’ve been able to personally listen to, it seemed like the least I could do. 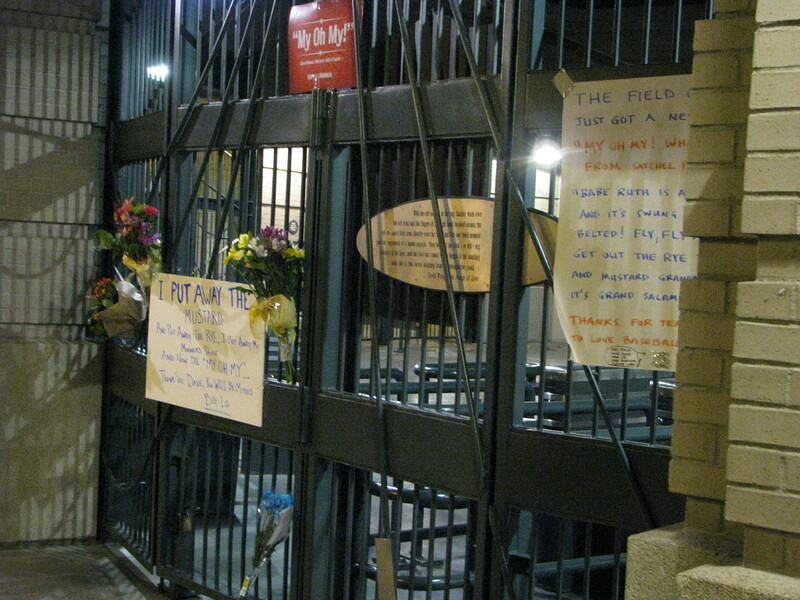 Rest in much, much peace, Mr Niehaus. It was a privilege and an honor to listen to you. 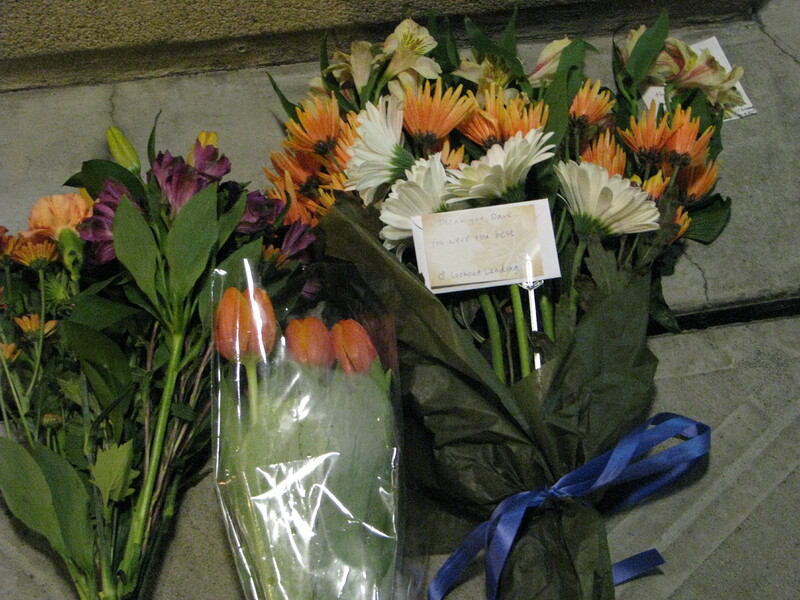 EDIT: there is expected to be an announcement sometime today (Thursday, November 11th) about a public memorial. 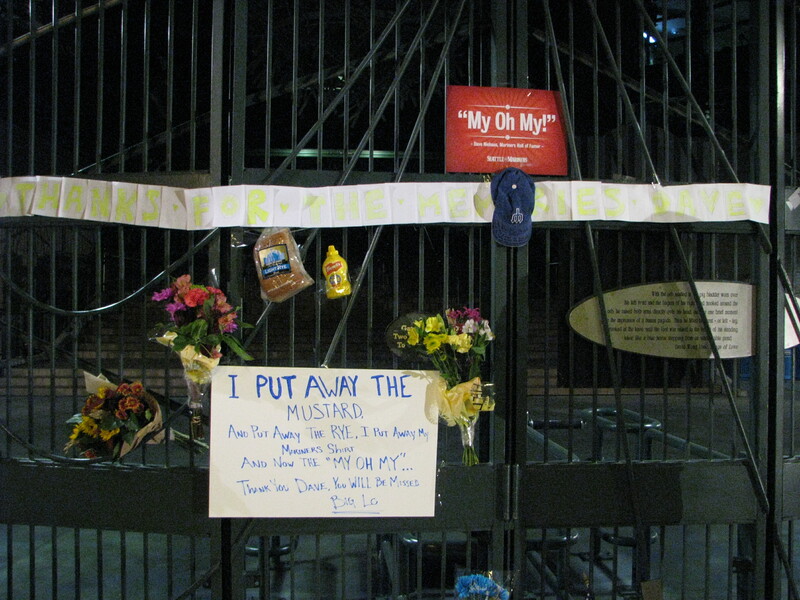 This entry was posted in Uncategorized and tagged goodbye dave niehaus. Bookmark the permalink. I’m still numb to it all. I can’t believe he’s gone. I don’t think it’ll truly set in until next season when his voice won’t be on the airwaves. 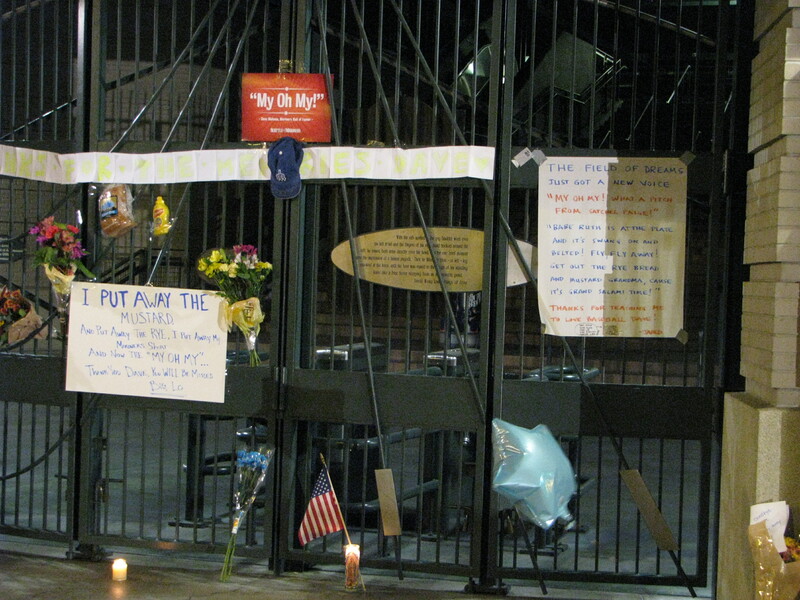 It’s a sad day for Mariner fans and a sad day for baseball. RIP. Damn, I should have gone down there. I probably would have caught the tail end of it at Jimmy’s.